Where are the Great Viking Kings Buried? Home › Culture › Where are the Great Viking Kings Buried? Many Viking burial mounds are found in Norway. Only a few have been excavated, and so far none of the graves of Norway’s great Viking kings are discovered. Where are they buried with all their treasures, and why are they not found? In Old Norse religion, a Viking who died with honor could bring with him “his worldly goods” to Valhalla: Viking Kings and earls were buried in burial mounds placed in their ships with slaves, livestock, dogs, armor, weapons, tools and valuables. The most famous burial mounds excavated contained the Oseberg and the Gokstad ships. In the Oseberg burial mound, skeletal remains of two women with unknown identity were found. They were buried around year 834 AD, and the oldest woman was 70 – 80 years old while the youngest was about 50. One theory is that the older woman was a “Hovgydje” (priestess), and the youngest was her slave. The burial mound, including the beautiful Oseberg ship, contained among other items four horse sleighs, a richly decorated chariot, 15 horses, dogs, oxen, seven beds and several woven tapestries. The Gokstad ship burial mound contained the skeleton of a 50-70 years old man. The identity of the person is not known, but one theory is that it may have been Olav Geirstad-Alf, King of Vestfold, who died about 900 AD. The burial site had been victim of grave robbers, and all weapons, jewelry and other objects that might be of any value were stolen. Luckily the robbers left something behind; among other objects a game board with game pieces of horn, fish hooks and horse harness parts made of iron, lead and gilded bronze. Outside the ship archaeologists found kitchen equipment, six beds, one tent and a sled – as well as 12 horses, six dogs, a peacock (!) and three smaller boats. In the period before Harald Fairhair in 872 AD united Norway into one kingdom, the country was divided into petty kingdoms. 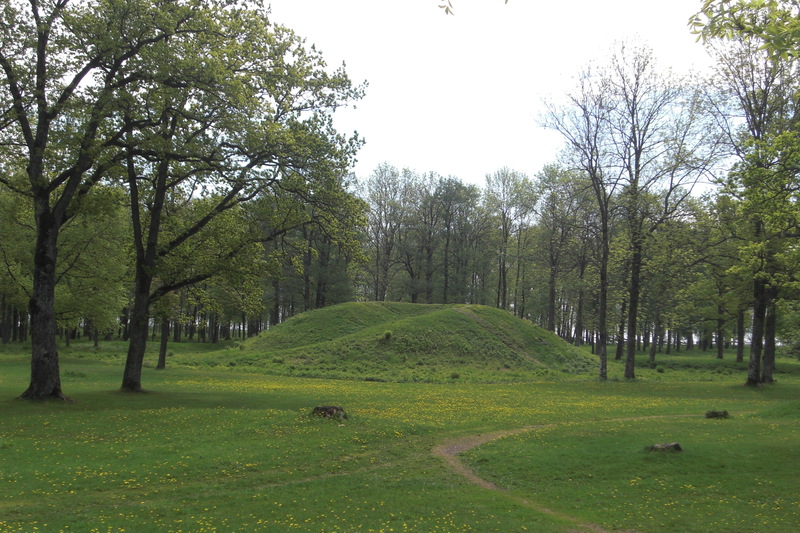 Almost none of these petty kings’ burial mounds are found. The list below shows great Viking kings who is buried in unknown locations. Halfdan the Black (about 810-860, king about 835-860) Norwegian petty king. Drowned in the Randsfjord. Unknown burial mound. Harald Fairhair (about 850-932, king about 872-932): Norway’s first king. Died in Rogaland. Unknown burial mound. Eirik Bloodaxe (about 885-935 , king about 932-935 ) : Died in Cumbria, England. Unknown burial mound. Haakon Sigurdsson , Earl of Lade (about 935-995 , de facto king about 970-997 ) : Died in Melhus in Trøndelag. Unknown burial mound. Haakon the Good (about 918-961 , king about 935-961 ) : Killed in Battle of Fitjar . Unknown burial site. Harald Greycloak (about 935-970 , king about 961 – 970 ) : Killed in the Battle of the Limfjord, Denmark. Unknown burial site. Olav Tryggvason (about 963-1000, king about 995-1000): Killed in the Battle of Svolder. Unknown burial site. You can learn more about the fascinating Viking Age here. excellent history, these mounds remind me of the american indians. Such a different culture with such similar traditions. thanks for sharing! The Kings, they were my 25,26,27,28..great grandfathers, would love to know where they are. Thanks for your research. You have Haraldshaugen in Haugesund, Rogaland where they claim Harald Fairhair is buried.. And Olav Tryggvason is said to be buried inside The Nidaros Cathedral.. none of them is verified but worth a note in the article maybe? Thank you for your interest and comment, Raymond! There are many speculations about where Harald Fairhair and Olav Tryggvason are buried. Hopefully, one day, we will know! Harald Fairhair was a popular king for 60 years (!) and must have been buried with a lot of treasures. would any have been put in there ship and burned maybe at the bottom off shore ???????? Unless I’m mistaken, Eirik Bloodaxe was a Christian. Hello Frederic, and thank you for your comment! But Halvdan Koht si not a recognized medievalist, and I wonder on what facts in Eiríkŕ’s life or death his assumption is based – apart from Eiríksmál. Eirik Bloodaxe died in 935, about 100 years before Christianity was introduced as official Norwegian religion. Many Vikings were pragmatic when it came to “adapting Christianity”. Some did, for practical reasons: Trading in Christian countries and serving noblemen as mercenaries. Still – Norway and Sweden were among the last European countries to convert. Lets us pretend Eirik was Christianized: Did he get a Christian funeral and was buried by his fellow pagan Norsemen according to Christian tradition? But – you could of course be correct. If so – why is not his grave mentioned anywhere? Halvdan Koht was recognized, but radical, and questioned Snorri’s sagas that were written down hundreds of years after the Viking Age – shaped by Snorri’s time period. Koht btw died in 1965. What I disagree with is Eirik being listed with the “kings who followed Norse religion”, because there’s no evidence for that. But he could very well have been a Christian, whether a strong believer or not, and still been buried in a burial mound. That’s what happened to his half-brother Håkon den gode a few years later.